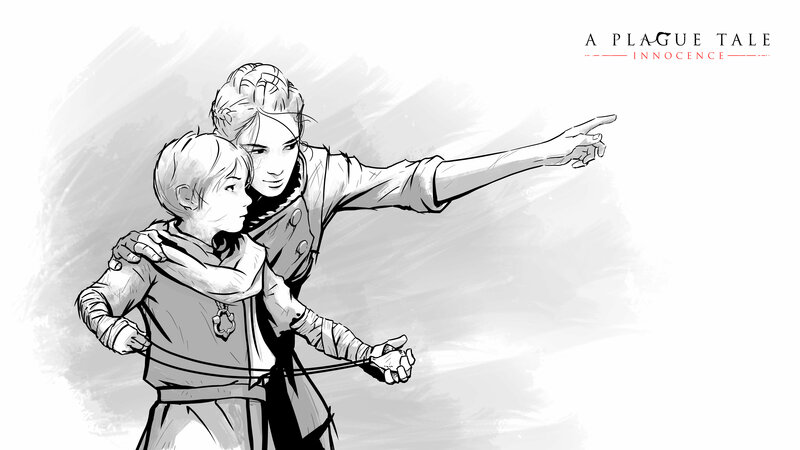 Welcome back to our Roots of Innocence series of articles, where we’re unveiling more details and info about the making of A Plague Tale: Innocence, Asobo Studio’s upcoming adventure game, coming 2019 to PlayStation 4, Xbox One and PC. A Plague Tale: Innocence is set in a plagued, medieval French Kingdom. Fear, war and disease generate violence. With no scientific means to fight the disaster, the people are defenseless. In order to ensure our game is consistent as possible within the period, we’ve committed ourselves to heavy research and the analysis of many historical texts. One thing that has struck us throughout this research, is unveiling the sadness that underlay much of the Middle Ages. Like many fairy tales and bloody legends before, we could clearly see one main topic: a tumultuous Europe. As you’ve seen in the 16-minute gameplay video released during Gamescom, 1349 was a war-filled year, which strongly inspired us during each step of development. Every element in the game reflects, as much as possible, this dramatic period. Architecture, siege engines, weapons, armor - everything has been researched down to the smallest details to offer players fantastic immersion within this historical period. Continuing this dedication to the historical setting, we also find it important to clarify the famous “trebuchet” that appears in the Gamescom demo. This siege weapon is actually what’s known as a “Couillard” – this is a smaller version which is easier to trigger by a smaller, less strong person, which is why our protagonists are able to use it. “Amicia and Hugo are children,” explains Kevin Choteau, our Lead Game Designer here at Asobo. “This means that in every environment, we need to make sure all their actions are actually doable for children. The game world has to be coherent for the players to believe the story and setting we create”. See you soon for more information and exclusive anecdotes about the creative process behind A Plague Tale: Innocence!